20 Ways to Save Money on Clothes - Women and Money Inc. Clothing can be expensive, and take a large chunk out of your budget. 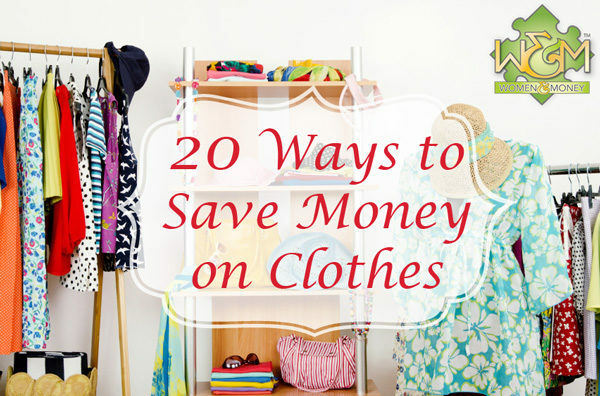 Be a savvy shopper following these 20 tips to save money on clothes. Only go into clothing stores when you are specifically searching to buy an item for your wardrobe, that you need. Don’t go in just to see what they have or what’s on sale, you will end up buying something you don’t need, or convince yourself you need something that you don’t. 2. Set your own cost limits for different pieces of clothing. What is the most you would be willing to pay for a certain item, taking into account your overall budget? If you have already decided you won’t spend more than $30 for an office blouse, you won’t get sucked into spending $40, and you won’t waste time trying it on. Always check prices before taking something off the rack. If you have basic sewing skills, you can transform your current unneeded clothing into something new (jeans to shorts, shorts to a skirt, etc) which means you don’t have to buy as many new pieces. 4. Sell old clothes to pay for new clothes. If you have quality pieces that are in good shape, but they no longer fit you or you just don’t wear them anymore, take them to a consignment store or sell them online. The money you get from those can be used towards new clothes, keeping costs down. You can find quality pieces for great prices at consignment shops and thrift stores. Some have even never been worn. Also accept clothing cast-offs from family and friends (especially kids clothing). You may find some or a lot of great things, and the rest you could donate to charitable thrift stores, or thrift stores who will give you a store credit for donations. 6. Only buy clothing when it’s on sale. You would probably think this would be tip #1, and it’s a big one, but reducing your consumption and being smart about your choices are just as important as getting a deal. Clothes always go on sale, so as a rule never pay full price! The exception would be if you need something now, while your size is available, and the item already abides to your cost list (see tip 2). If you buy clothes at full price, try to find a coupon or preferred shopper discount (see tip 9). Whether or not the store is having any sales, always check their clearance rack. 7. Be careful about ordering online. You can’t try it on before you buy it, and even if you don’t have to pay shipping to get it you will probably have to pay shipping costs to return it. So make sure you know your size and how the item will fit before buying clothing online. Check out the shipping costs and return policy thoroughly first. 8. Buy clothes at the end of season. Stores will be clearing out their summer clothing to make way for their fall line, so you can find great deals for bathing suits in August/September for example. Shopping off-season for children’s clothes can be a pitfall if your child grows faster or slower than expected, but if you know you’re kid’s average size and growth it can work. If you are not expecting significant weight loss or gain for yourself then you should be able to buy something to wear in 9 months’ time. 9. Join store email lists. If you are a big fan of a store and regularly purchase their clothes, sign up for their email list. You will be notified when they are having sales, and many times receive exclusive coupons or discount codes as a subscriber. If you are not a regular shopper to begin with, I don’t recommend doing this because it ends up being window shopping via email and will lead to more purchases than usual. 10. Check non-clothing stores for cheap clothes. Grocery stores, drug stores, and bulk stores like Costco sell basic pieces and underwear/socks for good prices and good clearance sales. Before buying the first piece you like, compare prices to other stores online (such as eBay) that sell the exact same item, or other stores that sell similar items. You need to know that you are paying a reasonable price, ideally the best price, before buying. 12. Buy for a specific purpose/place to wear. Don’t buy clothes that you may wear someday (if I am invited to a wedding, if I go on a tropical holiday someday, etc) because chances are good that you never will. Wait until you are booked/invited for a special event, or buy items specifically for work or home that you know you will wear. 13. Stick to classic styles and colors. When it comes to pricier items, go for classic shapes, fabrics and colors (not trendy) so that they can be worn for years, while paired with trendy accessories. 14. Keep an organized closet. When you know exactly what you have, and where to find it, you will be less likely to buy clothing you don’t need. Arrange your closet by season, by use (work, home etc) and by outfits, whatever makes sense to you. 15. Coordinate pieces and create outfits. Now that your closet is organized and you know what you have, always think about how new pieces of clothing will pair with other pieces you already own, or are purchasing. The more outfits you can use it for, the more wear and value you will get from it (if you have nothing to pair with it you won’t wear it). 16. Keep a variety, don’t load up on the same type of items. There is no need for more than five pairs of jeans and three blue skirts, etc. so if you’ve already got it in your closet don’t buy another one. 17. Have a combination of staples and statements. Make sure you have basic, solid pieces as well as “statement” colorful/fabric pieces (especially accessories), because too much of one or the other will hinder your wardrobe and keep you shopping for more. 18. Don’t buy multiple colors of the same thing. Never buy multiples of the same piece of clothing until you know it wears and washes well. If you buy four of the same sweater in different colors and then they shrink, stretch, pill, etc that is four sweaters trashed instead of one, and the deal you got was a wash.
19. Buy easy care fabrics. Don’t buy too many pieces of clothing that require dry cleaning, which significantly increases your clothing costs. Avoid clothes needing special washing (hand washing etc) as they are more likely to be ruined in the wash, or simply less likely to be worn. 20. Take proper care of your clothing. Read the washing instructions on each piece before buying, and before washing. Washing in cold water with like colors and hanging to dry will preserve your clothes for the longest wear. Pre-treat for stains, and be careful what is in the wash with your more delicate fabrics that may snag (such as metal zippers, hook closures etc). Use mesh bags to place either the delicate pieces or the scratchy ones in to keep them separate while in the same load of laundry.